In a social media-driven world, parents are faced with temptations to compare their own families to images and descriptions of the “ideal” family. Parenting books are quick to provide formulas and a “one-size-fits-all” approach to parenting choices, but each family has its own story—and God is writing it. 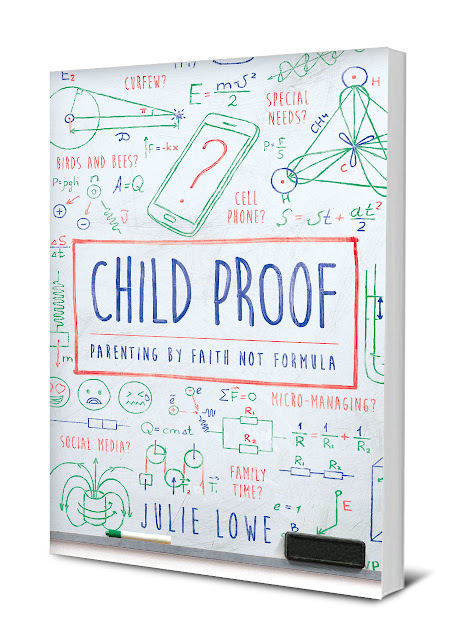 Child Proof: Parenting by Faith Not Formula (New Growth Press/September 24, 2018) by Julie Lowe challenges parents to rely on wisdom and Scripture to get to know the needs of their own home and to uniquely and wisely apply biblical principles to their own family lives. Just as God models individual, personal, and fatherly care to each of his children, Lowe encourages parents to do the same for their children through biblical wisdom, love, self-sacrifice, and commitment to godliness. Because every family is unique with differing needs, Child Proof helps readers prayerfully consider what loving their children looks like today. What does wisdom look like today? Life morphs and develops over time, in different stages, through various seasons. Formulas cannot adapt to the changes, but wisdom can guide in every situation. Applying biblical wisdom requires an intimate knowledge of your children (their personalities, history, and life together), which is why Lowe asks parents to become experts on their kids and come up with their own blueprint. Doing so will help them make gospel-centered parenting choices based on what love specifically looks like for their children. Working toward understanding their children—especially when they make poor choices—will help parents love their kids wisely. Her goal for Child Proof is to be one piece of the puzzle to help shape how people think, not a standard of how to do parenting. Julie Lowe is a faculty member at the Christian Counseling & Educational Foundation (CCEF). She holds an MA in counseling from Biblical Theological Seminary. She is a licensed professional counselor with more than eighteen years of counseling experience. Lowe is also a registered play therapist and has developed a play therapy office at CCEF to better serve families, teens, and children. Julie and her husband, Greg, have six children and serve as foster and adoptive parents. New Growth Press publishes gospel-centered Christian books, small group, and kids Bible resources for discipleship, biblical counseling, and missional ministry. For more information about Child Proof and other releases from New Growth Press, visit www.newgrowthpress.com.